Well this is a super cool discovery! Check the colors of the foams that just came out of these 2 hair and body washes! Not only do they have a tint of color, they also carry a distinctly recognizable scent of the original fruit from whence they come. 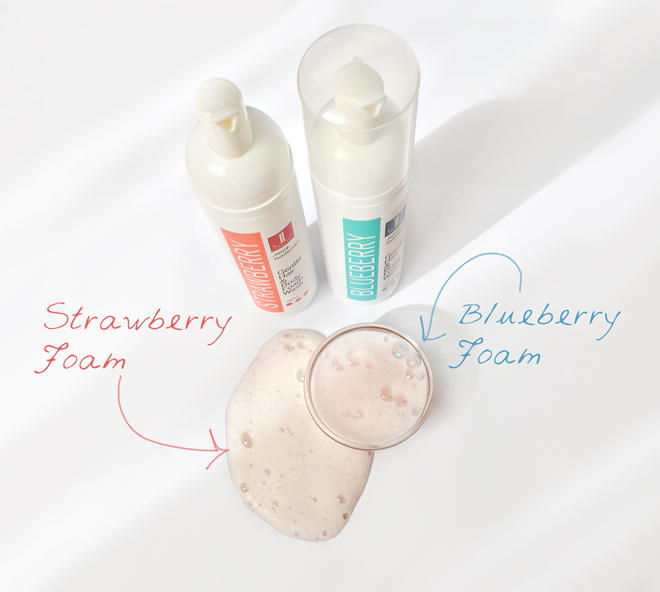 Each bottle contains (the same basic mix of) surfactants and skin-loving hydrosols in just the right combination to ever-so-gently wash both hair and body with a fluffy, light foam. And the color comes from the addition of fresh blueberry and fresh strawberry. No, I didn't squish blueberries and strawberries and put them into the bottles. Well, no, that's not even quite true. I did actually do some squishing of the blueberries. You might remember a recent post with this pic. Proof positive of berry squishing. The tinted foam has completely and utterly sidetracked me! The original intention of this post was to show you one of the things you can use fresh-food glycerites for, because a lot of you lovely people have been asking me about it. Adding a hand-crafted glycerite to your body wash formula gives it an extra dimension of freshness, and if you are using a pump bottle, I'll bet you notice an extra rich creaminess in the foam as well. 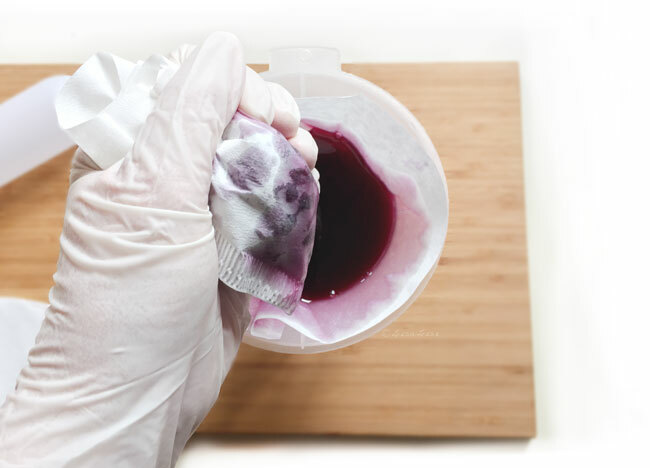 And if your glycerite has a deep color, I bet you'll be enjoying a creamy, lovely tinted foam as well. Have you ever added glycerites to your body wash? Which kind? I think glycerites are a great way to add the goodness of fresh fruit to our concoctions. Antocyanines not only give this vibrant colour, also are very potent antioxidants. Isn't it just a win-win situation? Thank you María, for your always inspirational and useful input! Thank you Lisa. I have really learnt a lot from you. Which surfactant do u recommend? Hi Jemila - It depends on what you want to make! Have a look at a previous post here called 'surfactant guide' - that might be of help.